This beautiful flower is one of the most recognized flower, considered a "happy flower" and comes in an amazing array of colors! Gerbera connotes warmth, beauty, purity and innocence. 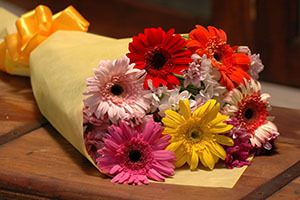 The soothing, comforting and vibrant effect on Gerbera flowers makes it a special gift to for those feeling really down and out. The flowers will cheer them up in an instant. The rich bloom also inspires creativity and vitality in the onlookers. Please take note that colors of the Gerberas may vary depending on availablity.